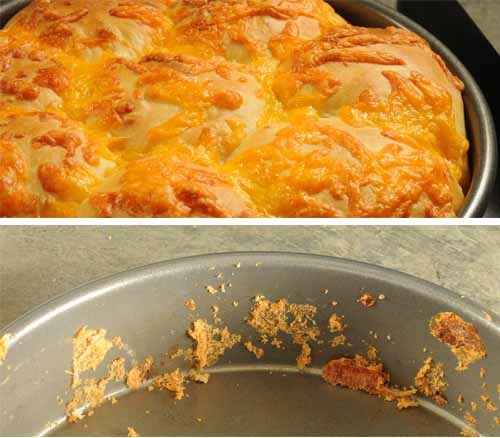 Cheesy-Crusted Yeast Rolls are a pillowy soft, cheese-infused dinner roll with a chewy, cheesy crust.. They make scrumptious slider buns, too. These may be the best cheese rolls on the planet! In addition to dinner rolls, try using Cheesy-Crusted Yeast Rolls as slider buns. Sliced ham and a little mustard is all you need for a memorable sandwich. The small size of slider buns helps with portion control. On the other hand, you could make your rolls twice as big (or any size you want since you’re doin’ the makin’ and use them as regular buns. I nearly always make these in my bread machine–but I used an electric stand mixer this time to illustrate a different method. Click here to see the same dough mixed and kneaded in a bread machine. 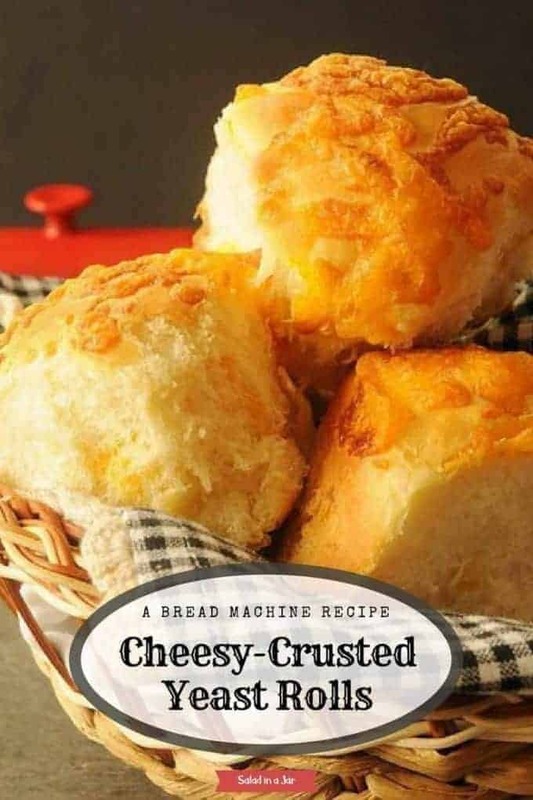 If you follow that recipe, don’t forget to knead in the shredded cheese after the dough has risen in the bread machine and before you make the dough into balls. Note: You can still use bread machine or instant yeast in a stand mixer. However, if you decide to use regular yeast instead, it must be dissolved before adding it to the other ingredients. Moreover, using regular yeast in a bread machine is acceptable, but it must be dissolved first. Use part of the liquid called for in the recipe to do that. See those cheesy bits left clinging to the pan? Consider them the cook’s reward. 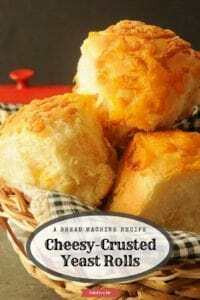 Cheesy-Crusted Yeast Dinner Rolls are a light and fluffy dinner roll with melty cheese on the inside and crusty cheese on the outside. 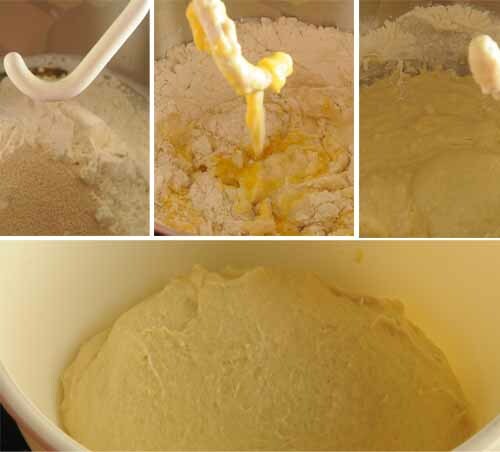 Using dough hook, start mixer on LOW until all ingredients are combined and mixed. Increase speed to 2-3 and knead 6-8 minutes or until smooth and elastic. Add additional flour 1 tablespoon at a time as necessary. Dough should begin to hold a shape and not level out. It may be slightly sticky but should not be a gooey mess. Remove dough from mixing dough, form into a loose ball and place in a greased bowl, turning quickly to grease all surfaces. Cover loosely and allow to rise to double in a warm place. Allow 60-90 minutes. Push dough down gently and turn out onto generously floured surface. 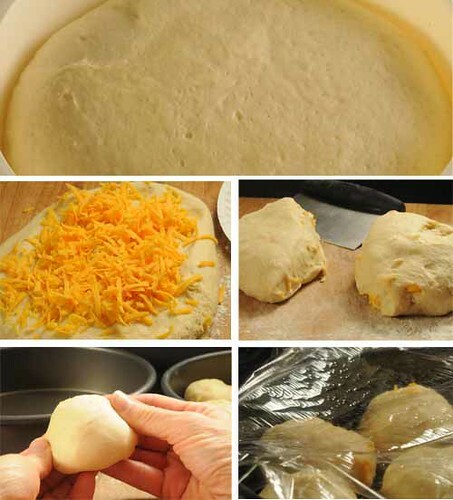 Place 1 1/2 cups shredded cheese on the dough and knead in. Cut dough in half. Then cut each of those halves into half and continue until you have 16 balls. Use your fingers to mold the dough into a smooth round ball. When you get the hang of it, the whole process goes quick. Place small dough balls in a greased 8 or 9-inch round pan. Cover loosely and allow to rise again until almost double. To make this recipe in a heavy-duty stand mixer, add ingredients to the bowl in the same order. Turn on low to mix until all ingredients are moistened. Using dough hook, turn speed to 2 or 3 and continue beating/kneading until dough becomes smooth and elastic, about 5-10 minutes. Cover and allow to rise in a warm place. Deflate dough gently and shape rolls as indicated in recipe. Please note: If you substitute regular yeast for instant or bread machine yeast, you must dissolve it first before adding to the dry ingredients. Stir it into about 1/4 cup of the lukewarm liquid called for in the recipe. Let sit for about 10 minutes. Add to other wet ingredients and then add dry ingredients. Proceed as directed to knead and shape rolls. Can you make this recipe into a loaf of bread? If so how long would you bake it? If I don’t have a stand mixer, what do you recommend? Can I mix it all by hand? Also, I made these once before and they got too brown on top without being all the way cooked inside. What am I doing wrong? I am thrilled with your instructions and recipes for rolls, the cheese rolls especially. The pictures are so real looking, you feel that you can pick up a roll and eat it. I just made these. They are wonderful and not too difficult to make. Thanks for sharing the recipe. so the flour that you use here is what kind? all purpose? or bread flour? I have used both successfully. I usually use all-purpose, unbleached just because it’s what I keep in the canister on the counter. WOW! They were delicious!!!!!! We saved them to feed to our volunteer help on Saturday and everyone LOVED them! Thanks for thinking of us…and thanks for posting the recipe so that I can make them now too! Wow! Your rolls are beautiful….and I love the little cheesy bits left over for the cook. Everything is better with cheese! These look so fluffy and delicious. Your blog makes me soooo hungry! These look delicious! I want some right now. It looks very fantasitc.May be the best cheese rolls on the planet! These look fantastic and are a must do! Love them with the cheese! Thanks! 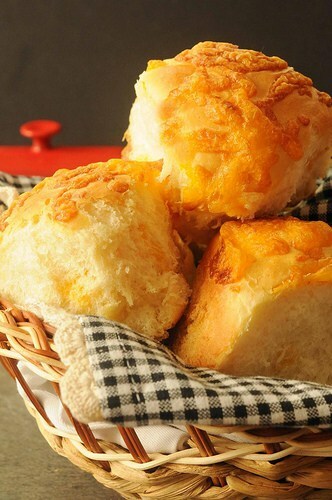 Mmm… cheese and rolls – very comfort food-ish! They also look so light and fluffy. Must be the “baker”. Are these going on your Easter table? I’m planning on popovers… but maybe these might show up instead!